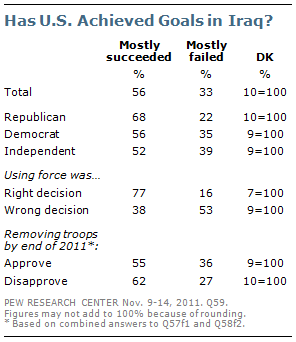 A majority of Americans (56%) say the United States has mostly succeeded in achieving its goals in Iraq. And the public is overwhelmingly supportive of winding down U.S. military involvement in the country: Fully 75% approve of Barack Obama’s decision to withdraw all U.S. combat troops from Iraq by the end of the year. Just 21% disapprove of Obama’s decision. The original decision to use military force in Iraq, by contrast, remains contentious. 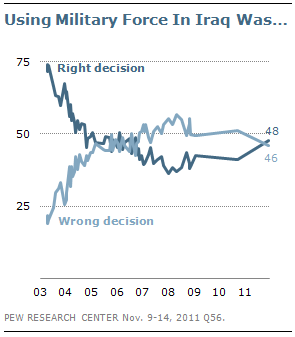 While 48% say the United States made the right decision to use military force in Iraq, nearly as many (46%) disagree. And more than eight years after the war began, that decision continues to be politically divisive: 72% of Republicans support the decision to use force compared with just 44% of independents and 37% of Democrats. Democrats overwhelmingly approve of Obama’s decision to withdraw all U.S. combat forces by the end of the year. Fully 90% of Democrats approve of that decision while just 8% disapprove. Independents support Obama’s decision by more than four-to-one (79% to 18%). However, Republicans are divided: 48% approve of Obama’s decision to withdraw all combat forces by the end of 2011 while 47% disapprove. Tea Party Republicans are much less supportive of Obama’s decision than are non-Tea Party Republicans. Just 42% of Republicans and Republican-leaning independents who agree with the Tea Party agree with Obama’s decision; that compares with 65% of Republicans and GOP leaners who have no opinion of the Tea Party or disagree with the movement. Notably, Obama’s decision to withdraw all combat forces by the end of the year draws as much support as his plans to withdraw combat forces did shortly after he took office. In March 2009, 76% approved of his plans to withdraw most combat forces by the end of August 2010. In the current survey, one group of respondents was asked whether they approved of Obama’s decision to withdraw all combat troops from Iraq while a separate group was asked whether they approved of the government’s decision to withdraw the troops. The results were almost identical: The decision, when attributed to Obama, draws as much support as when it is attributed to the government and Obama is not mentioned (75% approve Obama’s decision vs. 76% approve government’s decision). More than half the public says the United States has mostly succeeded in achieving its goals in Iraq, a view expressed by a majority of all partisan groups, but most common among the GOP. Almost seven-in-ten (68%) Republicans say U.S. goals have been met in Iraq, compared with 56% of Democrats and 52% of independents. Current assessments are very similar to predictions the public made in June 2010, when 58% of Americans said the United States would definitely or probably succeed in achieving its goals, while 35% said the United States would definitely or probably fail. Three-quarters (77%) of those who say using military force was the right decision say the United States has mostly succeeded in achieving its goals, a view shared by just 38% of those who say using force was the wrong decision. Majorities of those who approve of removing combat troops by years’ end and those who disapprove of that decision say the United States has mostly succeeded in achieving its goals in Iraq. Americans are divided over whether using military force in Iraq was the right decision. Nearly half (48%) say using force was the right choice, while 46% say it was the wrong decision. The percentage supporting the decision to use military force is at its highest point in five years. The last time more than half of Americans supported the war was in February of 2006, when 51% said it was the right decision. When the war in Iraq began in March 2003, more than seven-in-ten Americans (73%) said using force was the right decision. The share expressing this view dropped over the next year-and-a-half, dipping to less than half for the first time in October 2004, when 46% said using force was the right decision. The percentage reached its low, at 36%, in December 2007. It has remained at around 40% until the current survey. 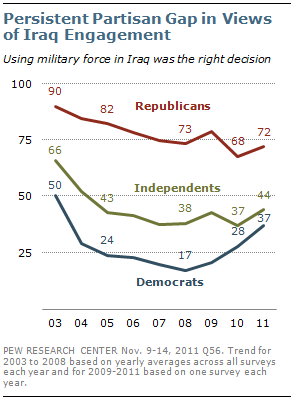 Since the start of the war, there has been a wide partisan gap over using force in Iraq. Even in March 2003, with major combat still continuing, there were substantial differences: 93% of Republicans supported the decision to use force, compared with 66% of independents and 59% of Democrats. This gap persisted through the first year. Across all surveys conducted in 2003, 90% of Republicans backed the decision to use force, compared with 66% of independents and 50% of Democrats. Over the ensuing years, support among independents and Democrats plummeted, while Republicans remained largely supportive of the war. In surveys conducted in 2008 – the last year of George W. Bush’s presidency – just 17% of Democrats said it was the right decision to take military action in Iraq, compared with 73% of Republicans. 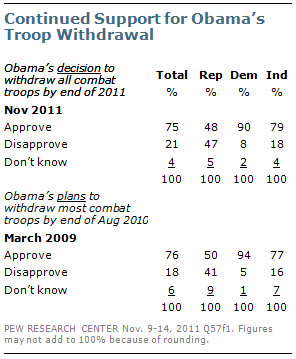 Since Obama took office, support for the decision to go to war in Iraq has increased among Democrats. In the current survey, 37% support the decision to use force in Iraq, up from just 21% in early 2009. Opinions among Republicans (72% right decision currently) and independents (44%) have changed less since 2009.